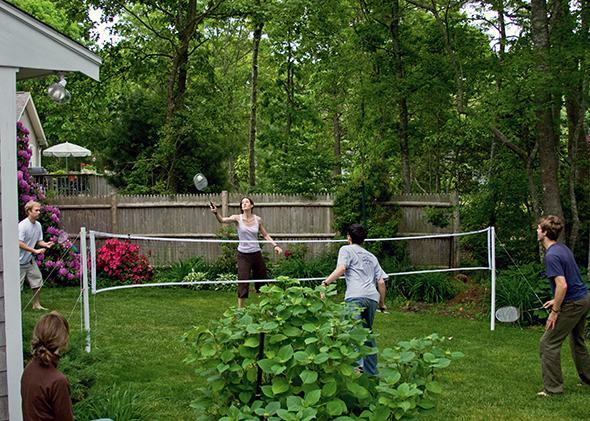 Badminton for summer parties: How to break the ice with kids and adults. Badminton is the best party icebreaker (well, next to alcohol). Anybody can play. Almost nobody plays that well. Throwing big parties, as many Americans will do this Labor Day weekend, is a great way to express affection for your friends, discharge multiple social obligations at once, get to know your co-workers better, and indulge in match-making (romantic or professional). It’s a real treat to see people from different parts of your life mingling and laughing together—but first you have to break the ice. Most of the people who come to my parties are scientists or journalists or other bookish types. Lovely, fascinating people once you get them going, but attending parties can be a real chore for the introverts among them. Many of them bring children who are shy about playing with strange kids, or irritated teenagers who keep getting told how much they’ve grown. The best way to cut through all the intergenerational awkwardness, I’ve found, is lawn games. And the best summer party lawn game of all is badminton. Lawn games draw people outside and away from your crowded kitchen. (It helps if you set up your bar, and a cooler full of Sunkist and Hawaiian Punch for the kids, outside as well.) They keep poorly supervised children from tipping over your tomato plants. And they give everybody something to do or watch or talk about while they’re finding common interests. The only rule in badminton is that you have to hit the birdie over the net. (Oh, sure, there are real rules, but don’t let people who know them enforce them.) You don’t need to bother marking the court boundaries or limiting how many people can play at once. Just set out a bunch of racquets and encourage anybody to jump in. It’s hard to hurt oneself or others playing badminton. You can hit the birdie as hard as you like and probably not do any damage. You can make heroic lunges, but it’s also perfectly possible to play badminton with a racquet in one hand and a beer in the other. Other lawn games make decent icebreakers, of course, but they’re no badminton. Whiffle ball is safe and easy, but it has fewer active players at any given time. Bocce takes a lot of explanation for young kids to catch on. With Frisbee, it’s just a matter of time before somebody gets hit in the back of the head. (I was guilty of a wild throw at a party years ago and still feel awful about it.) Ping-pong is a great crowd-pleaser, but you need space to store a table and have to haul it outside during a party. Best of all, it’s impossible not to laugh while playing badminton.